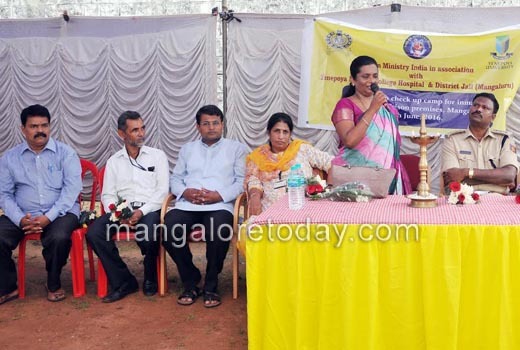 Mangaluru, June 06, 2016: Inaugurating a free health check-up camp at the District Prison in Mangaluru on june 5, Sunday, District Medical Officer Dr Rajeshwari Devi H R said the Government Wenlock Hospital will renovate the more than 100-year-old four-bed "prison ward" for sick hospitalized prisoners, which was in a pathetic condition as a modern six-bed ward within 15 days. she also added the new prison ward will be established in the existing special ward based on the jail rules. She advised the prisoners to bathe at least once a day as most of them suffer from skin-related ailments and also maintain hygiene on the prison premises. One should never wear wet clothes as they quickly spread the fungal infection. Exposure to sun is necessary for sometime to maintain good health,she added. She said the hospital has sent a Rs 174-lakh proposal to the government to establish a full-fledged prison ward in the District Wenlock Hospital premises through National Health Mission. If the proposal is approved, then the hospital will get a six-bed men’s ward, four-bed women’s ward, a room for care takers and a rest room for police. As of now, there is no women prison ward in the hospital and if women prisoners are admitted to the hospital, then they are housed in the special ward with police protection. Yenepoya Medical College Hospital Medio-Social Worker Vedavathy appealed to the prisoners to think positively. "A healthy body and a healthy mind will help overcome the past,". PMI, Prison Ministry India Co-ordinator Rev Prakash D’Cunha said PMI has been rendering yeomen service to the prisoners in Mangaluru for the last 19 years and throughout India in the last 30 years covering almost all the prisons. PMI volunteers extend their service irrespective of caste, creed or religion so that the prisoners don’t feel they are let down by the society. Prison Superintendent V Krishna Murthy urged the prisoners to make use of the opportunities made available in the prison. The officials have been extending all help to them to reform, he stated and warned of stringent action if they do not take a better path. More than 250 prisoners took part in the camp. They underwent blood pressure and sugar level check-up, skin tests and general health check-up. Many authorised volunteers were present.